First Nation’s commercial striped bass fishery approved. An article in the Miramichi Leader recently reported that the Natoaganeg First Nation’s band “Eel Ground” has been granted approval by the Department of Fisheries and Oceans for a commercial striped bass fishery with a quota of 50,000 fish per year. The details of the distribution are unclear at this time, but the times when the fishery will be conducted are in late May/June and then again in October. These are the times when the fish are in the river spawning and later preparing to overwinter. Many salmon fishermen will be pleased because they feel a thinning of the bass population is desperately needed. Striped bass are widely believed to be eating a high percentage of the Atlantic salmon smolts that migrate out of the river to sea at the same time the stripers are massing in the lower river to spawn. Survival of the smolts has been measured by the Miramichi Salmon Association and the Atlantic Salmon Federation, and while just a few years ago about 70% of the outgoing smolts survived to make it out of the river, now only about 25% are doing so. Certainly a quota of 50,000 fish can easily be sustained by the 1,000,000 fish Miramichi striper population. We just hope that the fishery will be conducted such that Atlantic salmon bycatch will not be an issue. Apparently the deal has been in the works for some time. Fishing is expected to begin this fall. It is not the only regulation that needs to be liberalized. The Miramichi Salmon Association wrote the DFO that bag and possession limits need to raised, and that there should be no limits on the taking of striped bass angled in the river above the head of tide – where they would presumably be eating parr. We sure agree with that! The trap counts for both grilse and salmon on the Southwest and Northwest Miramichi Rivers are down through July 15 compared to last year. Grilse numbers are off about 40% one year to the next, and salmon are down 20%. As of June 30th at least the salmon portion of the numbers had been up. It is too early in the season to draw firm conclusions on the run strength. It had looked brighter in late June, but we have been hit hard by heat this past month. The weather people are saying that a once in 30-year high pressure system is channeling hot, humid air so that it runs right up the east coast and into the Canadian Maritimes. Very unfortunately the warm temperatures have not been offset by good amounts of rain. Rain cools down the river, flushes out the warm water, and a full river is more resistant to being warmed. With water temperatures consistently too warm for salmon many fish will simply stay out in the Bay. Hopefully this will result in a strong fall run. Only time will tell. Things are pretty sleepy at Six Mile Brook Camp about 20 miles up the Cains River, but the fall isn’t all that far away now. Let’s hope that it is a good one, and that this pool and others like it will see plenty of big salmon this autumn. Yes, it is a tough situation. I guess you have to have faith. The Miramichi around my area had very good numbers of parr feeding all over the place this June as well as all other June’s that I’ve been there. Hopefully the adult salmon counts can bounce back quickly if they can get half a break. I would be very surprised if this makes any difference at all in Salmon which are being influenced by so many factors…the most important of which is the removal of adults by commercial fishing in the ocean and by native populations, not to mention other marine factors such as warming temperatures in the rivers and the ocean. In my experience, these types of interventions do nothing except impact the population targeted and in this case it will impact recreational angling for Striped Bass. It seems like everyone in the Miramichi area has it in for Striped Bass, instead of enjoying a healthy fishery for a great and delicious sportfish. It is a political move to satisfy First Nations that have asked for this fishery – nothing more than that. I look forward to the next 10 years to see what will happen. I hope I am wrong. Brad…I forgot to mention that another key factor in all this is the fact that many people rely on salmon due to lodges, camps and guiding…not to mention MSA, ASF, etc…so there is a real economic element to all this. People are worried about “their” salmon and the value of their business and properties along the river system. I am one of them – I own land on the Renous and Cains and I fish salmon much less know. I fish for bass instead and I am having a great time..enjoying it very much. My point is that this has less to do with the environment but more to do about trying to “save” salmon…trying anything. I just don’t think it’s the right approach from a fisheries science and ecosystem point of view. Phil – you and I have talked about this before, and I do not disagree that as an overriding fishery policy beating up on one species to help another is not a good policy. Unfortunately our ocean fisheries have been so overharvested for so long that we are in the business of putting out fires. All Atlantic salmon populations are experiencing tough times, perhaps for a multiple of reasons as you point out. The salmon fishery is also very important to a great many people – as is the striped bass fishery. I for one certainly believe that the two can co-exist; after all the two species have lived side by side in the Miramichi for thousands of years. In the world that exists now, though, with their original inshore competitors like cod in a collapsed state, the overprotected striped bass population has simply exploded. I remember the discussions about hoping to get the striped bass population up to 25 to 40,000 individuals. Now it is in excess of 1,000,000. When the smolts come down the Miramichi they are running into this incredible number of feeding bass. It is really a wonder that any at all make it out of the river. Salmon are not the only species to be beaten down by the bass. Smelts, gasperaux, and shad numbers are also pale shadows of what they were. The sea run brook trout fishery, which just 5 or 6 years ago was doing fabulously on the upper Cains River, has now virtually disappeared. No studies have been done to prove that it is striped bass that are to blame, but the dots look easy to connect. The 50,000 individual harvest of striped bass is very easily sustainable, and there is no reason that some of these fish shouldn’t be sold and eaten. The current teeny slot limit and bag limit are also far too restrictive. I completely agree with Hambrook and the MSA in their recent letter to DFO requesting no size limit in non-tidal water. Every striped bass caught up in the parr producing areas of the Miramichi should be removed. There were never any measurable amount of stripers in this area. These fish mean nothing to the overall striped bass stock. They are a clear sign of the bloated population. I think that all these things can be done and that we will still have a very vibrant striped bass fishery – and that is good – hopefully while allowing these other species a chance to exist in some reasonable abundance. The key issue is that DFO does not know how many bass are in the river. Their estimate is 250,000 to 900,000 and they specify that it is with HIGH uncertainty (their report and website confirm this). In fisheries science, when you have an inaccurate number, you definitely go with the lowest number in the range, as opposed to over-inflating the high number (which is what everyone seems to be doing). They need more science and solid data and should definitely not have made a decision with the current numbers. Nobody has been able to provide a credible reference for the 1 million+ bass so commonly used. I don’t believe there is one…so the number is made up. If the numbers are more like 250,000, then the 50,000 harvest is ¼ of the population, which is a totally irresponsible thing to do. With all the other environmental factors at play, I don’t believe the dots are that easy to connect. One such factor is gradually warming water temperatures in the river system. Without cool water, salmon will be gone, but bass don’t mind it as much. That will be a difficult issue to resolve, but I believe that better land management is a key – wider buffer zones in forestry on all streams, smaller clear-cuts to prevent rapid evaporation and improve water retention and cooling. Unless with have good science and reliable numbers, these type of management decision (like the First Nations fishery) should not be made. That’s why I think it’s mainly political and driven by salmon interests and First Nations. If, as a consultant, I made these type of decision based on poor data, I would have no clients. “In holding it up, a group assembled on the rock were chanting “Kill It! Kill It! Kill It!” Brad Burns’s recent report of the commercial fishing for these is certainly good news.” Excerpted by Ben from a recent post on his website. Ben’s comment above in support of the new commercial striper season came from the reaction he got from onlookers as he caught a striped bass below the Routhierville Bridge on Quebec’s Madapedia, River. Many of us have fished that pool which is well up into the parr habitat of the Matapedia. No living soul has ever seen this before. Hi Brad- My family has been outfitting on the Miramichi River since 1855. My family and generations of guides and neighbors have pondered the salmon situation for many years , always with a conviction and assumed authority that we “knew best”, but now in 2018 we are questioning our knowledge , the success rate of the conservation movement and definitely the decisions of our government leaders. For the first time in 163 years this particular outfitter does not have any answers. Extinction does not come when the last individual of a species is removed , rather it comes when that individual that takes the total population below the point of no return is removed. Are we there yet ? After 49 years of having the privilege of fishing the river I feel the balancing scales are tipping the wrong way. And Nero stands playing his fiddle as Rome burns. 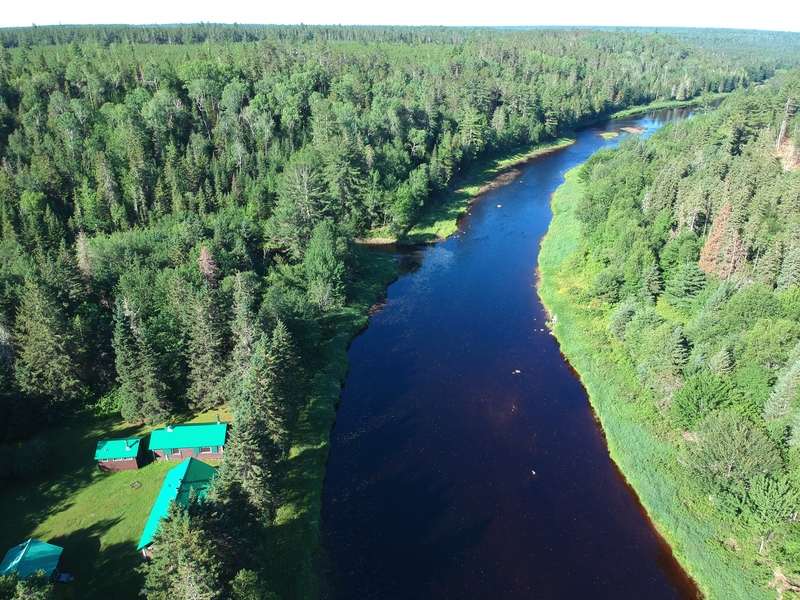 Hello to all concerned: Having successfully fished a tributary to the SW Miramichi for years, I am – as many – saddened by the present dwindling of the area’s most valuable resource … if the salmo salar is gone, what is there left? I too can enjoy fly casting for striped bass, but clearly, it’s just not the same. When there were no or few salmon or grilse going through the system in the past years, I would leave the rod on the rack and just go down riverside to my favorite lookout-point and find pleasure in observing the salmon swaying gently in the current. This year, there’s no such thing. But sadder yet was last year’s picture engraved in my mind: The pool, which years before held fifteen-pound hens now offered shelter to one, itsy-bitsy, single grilse! The attitude of the official side (is there such?) is hard to swallow: other than the closing of the so-called cold-water pools, are there any measures in effect? I’ve never heard of a Canadian (NB, NS, Nfl, Quebec) delegation to join forces and intervene, say, in Greeland, to make their/our standpoint clear. Canada is a rich country, can we show some muscle here? As far as I’m concerned, I can only do what’s in my power: Roll back the sleeves, exchange the fishing rod with pickaxe and shovel, go down to the river and free a couple of cold-water flows feeding into the main stream. This in hopes, that it may just save the one or two salmon that venture upriver despite the unhospitable envronment. John – I couldn’t agree with you more on the lack of support from both the Canadian and US governments on Greenland. Deplorable. Bradd, just saw new numbers posted for the CAST sonar site in Blackville thru end of July. It shows a 8741 total for >63 cm fish going upriver or about a 4400 increase since the first week of July. Seems at odds with the DFO trap net statistics. I’m curious about your opinion. I have been in communication with the folks who do this and they have told me they’re struggling to find the time to process the raw sonar data and post the results in a timely fashion. This seems the first time the data appears to contradict the DFO trap net data.